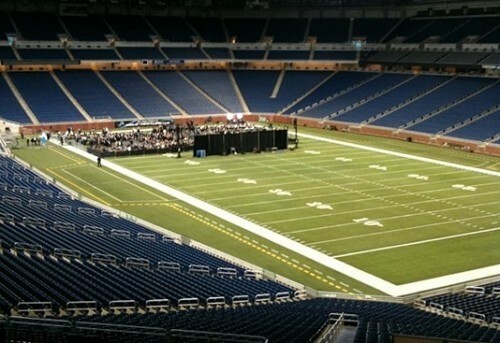 The stadium may have been empty but the speech certainly wasn’t. Most of what Romney addressed was familiar territory–raising the retirement age, privatizing Medicare, and repealing “Obamacare.” He also called for cutting things like subsidies to Amtrak and Planned Parenthood, which amount to pocket change in the federal budget, and bringing federal worker’s pay down to the same crappy level as people in the private sector. Here’s who would bear the brunt of that sacrifice (BCCA is an acronym for Breast and Cervical Cancer Prevention and Treatment Act that allows states to provide early access to Medicaid to women with cancer). 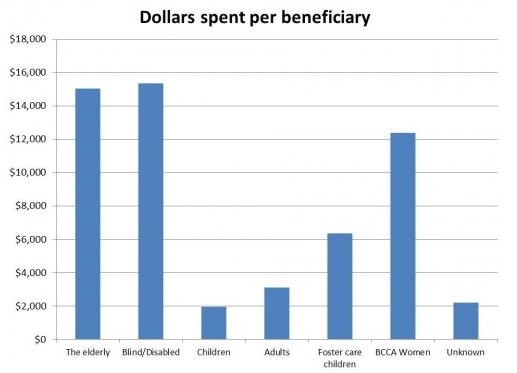 “…[T]he amount we spent per blind or disabled person, or per elderly person, is much, much more than the amount we spend per child or adult. This means that if we really want to cut Medicaid spending, and we want to do it on the backs of adults or children, we will have to drop many, many more of them to make a real impact on spending. 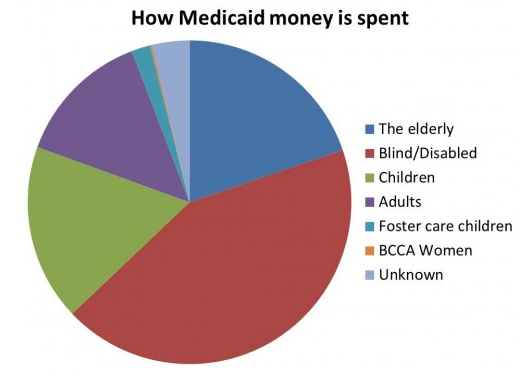 If we cut 1 million elderly from the Medicaid rolls, we reduce Medicaid spending by about 5%. If we cut 1 million adults, however, we reduce Medicaid spending by only 1%. We need to cut 5 times as many adults. If we want to cut Medicaid spending by 10%…we’d need to drop more than 10 million adults from Medicaid. That’s almost three-quarters of all of them. If we want to cut overall Medicaid spending by 20%, then we’d need to drop all non-elderly adults, including all pregnant women, as well as about 10 million kids, or more than a third of them. So what will we do? Should we cut some of their benefits instead? Again, look how little we already spend on children and adults. If we cut spending on every child and every non-elderly adult by 25%, that will reduce overall Medicaid spending by less than 8%. Right on, Mitt. Let’s take all that “free stuff” away from all those “something for nothing” freeloaders like the blind, the disabled, the elderly, and women with cancer. They’ve had it too easy for too long. It’s high damn time they sacrificed something so your buds can have another yacht to water ski behind or another vacation home. “Some of the country’s best-known multi-national corporations closely guard a number they don’t want anyone to know: the breakdown between their jobs here and abroad. Call that return on investment. “The latest data show that multinationals cut 2.9 million jobs in the United States and added 2.4 million overseas between 2000 and 2009. …GE breaks out its employment numbers in company filings to the Securities and Exchange Commission. In 2010, about 46 percent of GE’s 287,000 employees worked in the United States, compared with 54 percent in 2000. …Data from before 2009 showed IBM rapidly shifting workers to India. Dave Finegold, dean of the Rutgers School of Management and Labor Relations, estimates that 2009, when the company stopped sharing its U.S. employment figure, also marked the first time the company had more employees in India than the United States. “…that’s not how it worked last time. Congress and the Bush administration gave companies a similar tax incentive, in 2005, in hopes of spurring domestic hiring and investment. 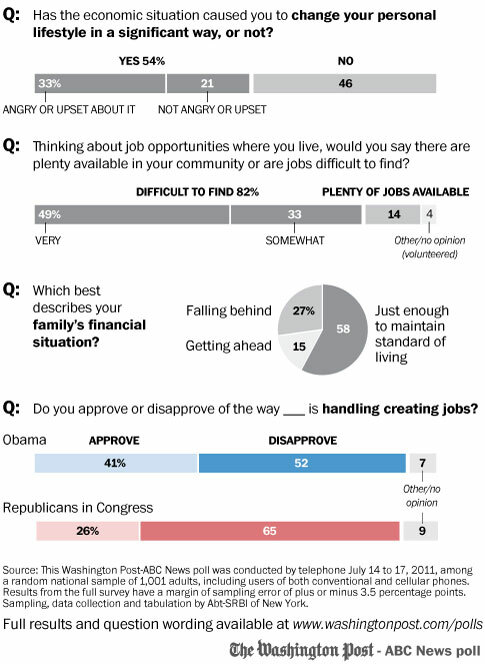 82% say jobs are difficult to find, 85% say they are either just holding on or falling behind. Is anybody in Washington listening? Does anybody in Washington care? “This “debt crisis” in no way had to happen. No natural disaster, no tsunami, has suddenly pounded the United States out of fiscal balance. We have simply suffered a colossal political failure. Our powers that be, by feeding the rich and their corporations one massive tax break after another, have thrown a monstrous monkey wrench into our national finances. Some numbers — from an Institute for Policy Studies report released this past spring — can help us better visualize just how monumental this political failure has been. Similarly stunning numbers have come, earlier this month, from MIT economist Peter Diamond and the University of California’s Emmanuel Saez, the world’s top authority on the incomes of the ultra-rich. These two scholars have shared some fascinating “what ifs” that dramatize how spectacularly the incomes of our wealthiest have soared over recent decades. In 2007, Diamond and Saez point out, taxpayers in the nation’s top 1 percent actually paid, on average, 22.4 percent of their incomes in federal taxes. If that actual tax burden were to about double to 43.5 percent, the top 1 percenter share of our national after-tax income would still be twice as high as the top 1 percent’s after-tax income share in 1970. So why aren’t we taxing the rich? Why are we now suffering such fearsome “debt crisis” angst? Why are our politicos so intent on shoving the “fiscal discipline” of layoffs and cutbacks — austerity — down the throats of average Americans? Just a Little Bit of History Repeating? “In February 1993, Canada was in the midst of financial catastrophe, or so one would have concluded by reading the newspapers and watching TV. “Debt Crisis Looms,” screamed a banner front-page headline in the national newspaper, the Globe and Mail. A major national television special reported that “economists are predicting that sometime in the next year, maybe two years, the deputy minister of finance is going to walk into cabinet and announce that Canada’s credit has run out…Our lives will change dramatically. The phrase “debt wall” suddenly entered the vocabulary. What it meant was that, although life seemed comfortable and peaceful now, Canada was spending so far beyond its means that, very soon, powerful Wall Street firms like Moody’s and Standard and Poor’s would downgrade our national credit rating from its perfect Triple A status to something much lower…The only solution, we were told, was to radically cut spending on such programs as unemployment insurance and health care. Sure enough, the governing Liberal Party did just that, despite having just been elected on a platform of job creation. …[F]or the Canadian financial community, the “deficit crisis” was a critical weapon in a pitched political battle. At the time Truglia was getting those strange calls, a major campaign was afoot to push the government to lower taxes by cutting spending on social programs such as health and education. Since these programs are supported by an overwhelming majority of Canadians, the only way the cuts could be justified was if the alternative was national economic collapse – a full blown crisis. “The third ranking Democrat in the Senate says a deficit-reduction proposal put forward by Majority Leader Harry Reid has the best chance of ending the political stalemate and avoiding a government default. While the Treasury Department has yet to specify exactly the size of the increase Congress will need to approve for the $14.3 trillion debt limit, estimates are currently settling in around $2 trillion. That means, according to Speaker Boehner, that the White House and congressional Democrats would have to agree to spending cuts equal to at least $2 trillion as well. The only thing “off the table” is tax increases, said Boehner. So after 6 weeks of kabuki, we’re right back where all this began. And unemployment is still our biggest problem. Nice. Who Said It? Barack Obama or Herbert Hoover? “What we now face is a President who insists we are in a debt crisis that reputable economists say is phony, a product of deficit hysteria, political cynicism, and economic ignorance.. And he insists the debt crisis requires we take economically damaging steps that will harm the public by undermining popular and beneficial programs to preserve our future. He’s told us we must do this to achieve economic prosperity and that we can’t even have a meaningful conversation about the jobless until this is done so the debt problem is not just a distraction; solving it is a prerequisite to economic recovery. Eat your peas. FYI, the first one is Obama, the second, Hoover. I sense that the railroading of the American public will commence shortly. That August 2nd deadline for either raising the debt ceiling or facing economic crisis has now been moved up to 4pm today, so says Speaker Boehner and Treasury Secretary Geithner. Since when do the ratings agency crooks who aided and abetted the banksters—and profited handsomely from doing so—leading up to the mortgage meltdown, get to dictate economic policy? But I digress. It would also require only a simple majority vote. Isn’t it amazing how that 60-vote filibuster thingy isn’t an obstruction when it comes to what Congress really really wants to do? Like screw us over. “We commented last night on the parallels between the pressure tactics used to railroad the passage of the TARP and our current contrived debt ceiling crisis. The similarities have increased in a predictably bad way. Even worse than the economic toll radical budget cutting will impose on ordinary Americans is the continued undermining of basic democratic processes.